Thanks to the good guys at Android Authority. Here is what we all want to see. Samsung GALAXY Note II side-by-side comparisons to other popular smartphones such as GALAXY SIII, the original Note and iPhone 4S. If you have not switched camp, about time to do so! They may win the case, but the Note II will earn it back easily! 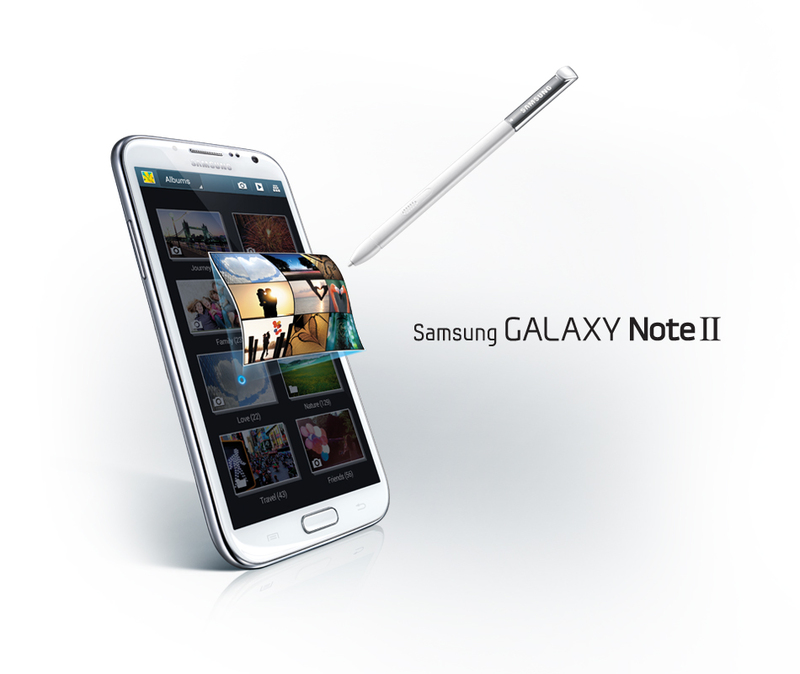 Samsung GALAXY Note II Announced Today! Brace yourself for the highly anticipated Samsung GALAXY Note II. Hot off the IPA 2012 today! The official Note II hands-on video in details. All the new features of Galaxy SIII and Galaxy Note 10.1! 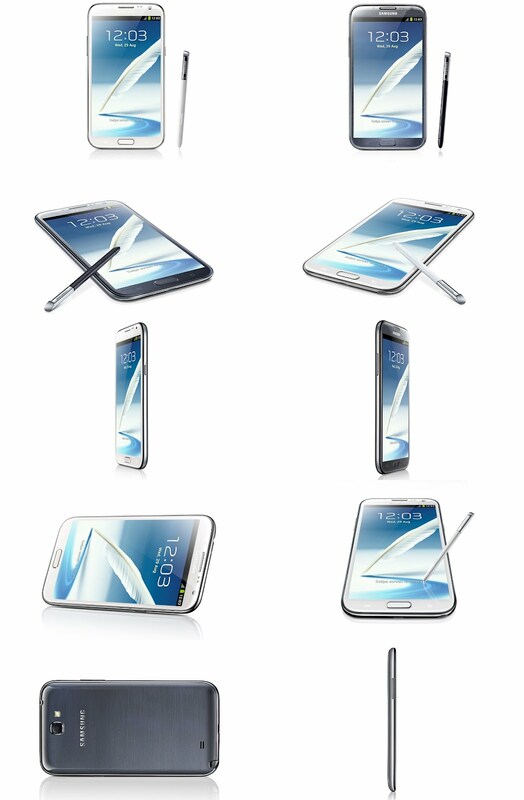 This is how the GALAXY Note II compares to Note. The Note II is slimmer (80.5mm width x 9.4mm thick) and more curvy compared to the original Note (83mm width x 9.7mm thick) which is tad too wide to hold and more blocky. In fact, the Note II (151.1mm width) is taller to accommodate the wider screen, compared to the former Note (146.9mm width). It is obvious that the Note II takes after the Nature-inspired form of GALAXY SIII. However, the Note II gained a 0.2g. 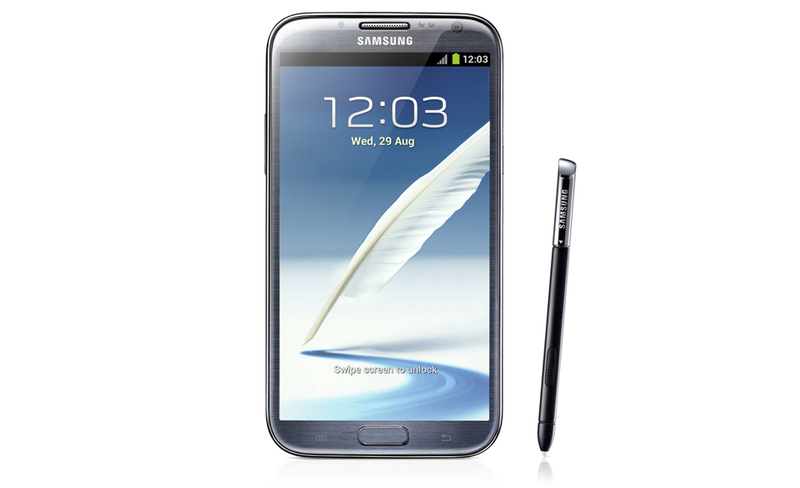 The GALAXY Note II is expected to hit the shelves in October this year. I had earlier shared about getting a mini wireless keyboard/touchpad for use with the MK802 Android 4.0 Android Mini PC. If you find that the touchpad is too small for the thumb to navigate, there is another option available. This option is a much more interactive one, but needs a little getting used to. Have you heard of an Air Mouse? If it seems foreign to you, an Air Mouse functions like the Nintendo Wii Remote. It using in-built gryoscopic mechanism to navigate the mouse. There difference is that with the Air Mouse, you do not need a sensor attached to your screen. I realized that it is there is no review of the Astone R3 Motion Air-mouse Remote Control with Mini Keyboard, so I decided to do up a quick one of this "R3MOTE". The Astone R3 Motion Air-mouse Remote Control with Mini Keyboard comes in a simple packaging that shows life-size images of the controller. The R3MOTE is an optional accessory when you purchase the Astone Android TV box. The R3MOTE utilizes innovative free space motion-sensing which transforms hand motions into natural, responsive cursor controls. The R3MOTE is a 3-in-1 device: remote control, air-mouse and keyboard. It connects to your USB host via a receiver dongle via 2.4GHz wireless and has an excellent range of up to about 30 metres. The R3MOTE is powered by advanced Li-ion batteries that has can standby up to 600hours and auto-sleeps. Recharging the R3MOTE is fast and easy with mini-USB port. Accessories include a very simple user manual, wireless receiver dongle, mini-USB cable. The R3MOTE comes in a sleek piano-black finish and looks very similar to the remote of an aeroplane entertainment system. One side is the controls for the Air Mouse. Flip to the other side for the QWERTY Keyboard. Hold the R3MOTE like a TV remote and navigate the mouse cursor using Air Mouse like how you would use the Nintendo Wiimote. The Good: The R3MOTE is feels very comfortable to hold in the hand. The Air Mouse is also very easy to use, if you are familiar with using the Nintendo Wiimote. The sensitive of the R3MOTE is almost comparable to the Wiimote. However, the sensitivity can never beat a mouse or trackpad. Nevertheless, I could move the mouse cursor easily and select the small close button "X" on the browser without any complaints. The positioning of the left mouse button has been carefully thought of and makes point and select easy with a thumb press. Flip over to the keyboard, the air mouse goes into a temporary inactive state, hence you wont have the mouse cursor running around while you are punching in the keys. This is a carefully thought of feature as well. The cursor and left mouse buttons are carefully placed on the Air Mouse to be within the thumb's reach. After getting used to the Air Mouse, it is now easier and more fun to navigate using the R3MOTE. It also makes the user experience more ergonomic compared to the the A.C. Ryan Wireless Mini Keyboard/Touchpad. The Bad: All is not good as the R3MOTE does have its disadvantages. I am slightly disappointed that there is no dedicated Home button and Menu button on the Air Mouse. If you are not familiar with playing Nintendo Wii, you may get slightly frustrated. The keyboard is not a full Windows keyboard. You do not have dedicated "Start Button". The "Home", "www" and ".com" keys do not work on the Android and PC at all. There are no dedicated number keys, hence you need to toggle the "Fn" key. When you are in the keyboard mode, you lose the left and right mouse buttons. I would still prefer the keyboard of the A.C. Ryan Wireless Mini Keyboard/Touchpad. The R3MOTE is quite long, and when grabbing the keyboard with both hands, my thumbs are not long enough to reach the middle of the keyboard. Score this mini keyboard with touchpad to control the MK802 Android 4.0 Mini PC. This little controller goes everywhere and anywhere and is the perfect companion for the MK802 Android 4.0 Mini PC. It is easily operated using 2 thumbs. This controller is the ultimate single wireless solution for your home theatre set up, with Keyboard functionality, Touchpad for mouse navigation, Function keys for media playing, and Navigation keys for web browsing. Compatible with AC Ryan Playon!HD2, Playon!HD Mini 2 and Playon!DVRHD. Windows 2000, XP, Vista, CE and Windows 7. Linux, Mac OS X, Android devices (supporting USB keyboard & mouse), Playstation 3 and Xbox 360. The controller reminds me of the Palm-Pilot days, or QWERTY phones. It is so small that it is pocketable and very mobile. Since you already plan to hide the MK802 Android 4.0 Mini PC behind the TV, why not choose a mobile keyboard that hides blend in among your TV remotes. Have you ever wanted to ditch that old HDTV for a snazzy Smart TV? You can now transform your cheap and ordinary HDTV into a high-end Smart TV powered by Android 4.0 Ice Cream Sandwich! This is made possible by a tiny device which is not much bigger than a thumbdrive, MK802 Android 4.0 Mini PC! MK802 Android 4.0 Mini PC packs a 1.5GHz ARM Cortex-A8* processor, 1GB RAM*, 4GB internal storage with Wireless 802.11g/b/n capability, running a rooted Android 4.0 Ice Cream Sandwich software. *Specifications may vary even though the device that you buy may bear the same name and appearance. There may be generic Android TV boxes available out there, but nothing beats the MK802 Android 4.0 Mini PC in terms of form-factor. This little guy simply hides away behind your HDTV and delivers rock solid Android ICS performance. Till date, MK802 Android 4.0 Mini PC packs one of the most powerful specifications in the smallest form ever, at a ridiculously cheaper price than all other Android TV boxes out there! Read on to discover what this little device can do for you! A simple and atypical Android style box that is nothing worth bragging. For the price, I do not expect much from marketing gimmicks. MK802 Android 4.0 Mini PC in its insert tray. The MK802 Android 4.0 Mini PC comes with a mini-USB cable, mini-HDMI cable, mini-USB-to-USB converter (OTG) cable, 5V 2A power supply and operator manual. The little guy measures at a mere 90 x 35 x 14mm size. MK802 Android 4.0 Mini PC comes with a mini-HDMI port, OTG/mini-USB port, microSD slot, standard USB port and a port for the power supply adaptor. The microSD card slot on the side allows you to extend the memory from 4GB up to 32GB via a microSD card. The standard USB port may allow you to plug many peripherals, but you essentially require this port to hook up to a USB mouse/keyboard. Beside the USB port is the port for the power supply adaptor (provided). This device draws 5V, 2A power, similar to tablets and iPad. 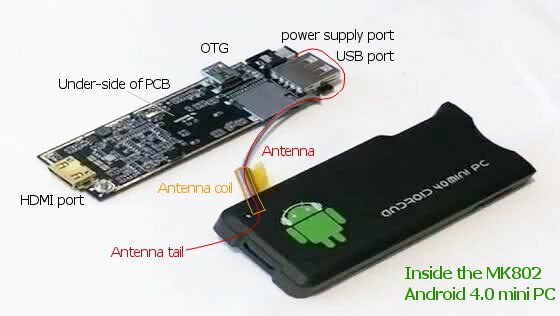 The mini-USB port or OTG (On-The-Go) also allows you to connect peripherals such as keyboard, mouse, flash drive via the OTG cable or mini-USB-to-standard USB port converter cable (provided). This port can serve as a USB host. However, instead of using this port to host devices, I would use this port to power up the device! Yes, without using the 5V 2A power supply adaptor. mini-USB cables are already abandoned by modern Android phones, you may have some lying around at home or you can use the one supplied with this device. Simply hook up the cable to an existing USB port on your HDTV. Read on to find out how I do that. The mini-HDMI port that transmit your display and sound to your HDTV, via a mini-HDMI cable (provided). The small size of the MK802 Android 4.0 Mini PC blows all other devices away! No other devices comes close to such small form-factor. See how the MK802 Android 4.0 Mini PC matches up to other devices and toys. Unleash the potential of your HDTV with MK802 Android 4.0 Mini PC and transform your ordinary HDTV to a giant 40" tablet (less touchscreen capability). Regardless the size or type of your HDTV, as long as your TV has a HDMI port, it can be used with MK802 Android 4.0 Mini PC. (1) Connect the device to the TV via the provided mini-HDMI cable. The display will be optimum if you are using a FullHD 1080p LCD or LED HDTV, Plasma displays tend to be 720p and are not as sharp as LCD or LED HDTV. (2) Connect a control device via the USB port. The only way to control the Android OS is via a USB device. USB mouse is essential to navigate around, while a USB keyboard is not necessary since the device has a pop-up soft keyboard like any other Android devices. However, if a USB keyboard is present, the soft keyboard will not appear. I would strongly recommend getting a Bluetooth mouse/keyboard as you do not really want to sit too near to the big screen. I have found a perfect Bluetooth keyboard from Logitech. 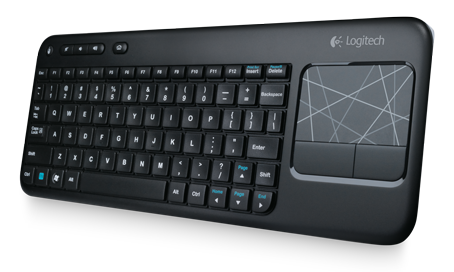 The Logitech K400 is a small keyboard with a trackpad like your laptop, hence you won't need a mouse! Note that MK802 Android 4.0 Mini PC does not have a Bluetooth radio, which means you need to connect the Bluetooth mouse/keyboard via its Bluetooth receiver. How about a palm-sized keyboard with touchpad? How about navigate in Nintendo Wii style with an Air Mouse? (3) Connect the power source. You can connect the MK802 Android 4.0 Mini PC using the supplied power adaptor. Another way is to power the MK802 Android 4.0 Mini PC up, using the mini-USB port via the supplied mini-USB cable! A standard 5V USB port can supply enough juice to power up this little guy! So does your HDTV have a USB port? If no, check again. Some lower end HDTV do not have a USB port that allows user to plug in flash drives. However, the manufacturers usually do not advertise that these HDTV will usually have a "Service Port". The "Service Port" is essentially a 5V USB port meant for the manufacturer to service your TV. Connect the mini-USB cable to this "Service Port" will also power up the MK802 Android 4.0 Mini PC! Another advantage to plug the MK802 Android 4.0 Mini PC to the USB port on the TV is such that it shutdown and startup along with your TV. I will then hide the device and all the cables behind the HDTV and make my old HDTV appear like a Smart Android TV. Viola! Your 40-incher Android 4.0 Ice Cream Sandwich "tablet" is raring to go! (4) Connect to your WIFI network. The MK802 Android 4.0 Mini PC only support WIFI, so you need to have wireless network at home. Log-in with your Google account and the device will start sync. MK802 Android 4.0 Mini PC will update itself and the pre-installed apps. Market instantly updates to Google Play. Other pre-installed apps include Youtube, Twitter, Angry Bird Space, Facebook, Skype, Browser, Youku, PPTV, PPS and Docs-to-go Office. Good to know that the MK802 Android 4.0 Mini PC is rooted and not region-locked, hence you can view streaming shows without getting blocked! You can now enjoy your full Android Ice Cream Sandwich experience on your HDTV! Seriously, at the ridiculously cheap price, it is worth overlooking all the cons! If you are experiencing that your wireless or WIFI signal is dropping out constantly, it is not because of any interference from your other wireless signals or wireless keyboard/mouse. It is also not due to the intefering RF signals from your HDMI cable. It is due to a simple positioning of the Antenna. You can fix this yourself easily. All you need is some cheap electrical insulation tape. The wireless signal is transmitted by the wire Antenna. The Antenna wire is the thin wire insulated in a grey plastic sheath. The Antenna is soldered onto the top-side circuit board (PCB). It is then squeezed in-between the power supply port and USB port and passed over to the under-side of the PCB. The Antenna is then goes into a metal cylinder or Antenna coil, and then out. You will observe that the Antenna is now not insulated with the grey sheath at the Antenna tail. The Antenna tail is exposed. The problem lies here! The naked Antenna tail can come in contact with the soldering spots on the PCB and also the metal surface of the HDMI port. This causes sort of a "short circuit" or signal interference, resulting in the constantly dropped wireless connection. Now, get your electrical insulation tape and wrapped the whole Antenna, all the way to the Antenna tail. Make sure that there is no visible or exposed Antenna and Antenna tail. Carefully reassemble the PCB into the shell. All myth is busted! Viola, test run a YouTube clip, and watch your signal maintain at maximum with no more signal drop out and disconnection of the WIFI! If this fix works for you, or you like this fix. Please LIKE this post below.